As a nurse, understanding Advance Care Planning, Personal Directives, Goals of Care Directives, and the Green Sleeve documents are important to providing quality care to your clients. They are also important personally. 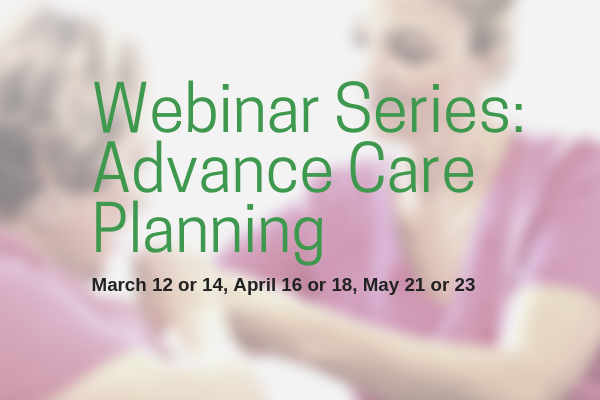 Master these topics in the three-part Webinar Series: Advance Care Planning, brought to you by the College of Licensed Practical Nurses of Alberta (CLPNA). All webinars are FREE! No registration fee to attend. If you were unable to speak for yourself, who would make medical decisions on your behalf? Have you written a Personal Directive to make sure that person has the legal authority to do so? Learn the steps involved in the Advanced Care Planning process. Be provided with tools to write your own Personal Directive. Learn about legal and professional obligations that impact your nursing practice. Discover why Personal Directives are key in providing patient-centered care. Build understanding and confidence around interpreting GCDs. Explore the importance of Goals of Care conversations. Learn what nursing roles and responsibilities are around GCDs. Documentation related to both Advance Care Planning (ACP) and Goals of Care Designations (GCD) directly impact nursing practice. As healthcare providers, we need to be aware of what these documents mean and how to ensure this information gets communicated to other healthcare providers. Learn processes related to Personal Directives and GCD order forms. Learn nursing roles and responsibilities in documenting on the ACPGCD Tracking Record. Discover what the Green Sleeve is, why it is important, and what we need to ensure patients/clients know about it. Unable to attend or want to watch again? These presentations will be recorded and made available on our LPN Professional Development playlist on YouTube at a later date. Awesome!! Very important topics. Thanks in advance. I can’t wait to attend this webinar. Awesome topics. Thanks! Unfortunately, due to work commitments, I will be unable to attend. ‘Just wondering if these webinars will be put on Youtube at a later date? I am looking forward to this information as I am working in home care and this will help me with my clients. Dome commitments…when I will be able to watch on YouTube..Thx !! !